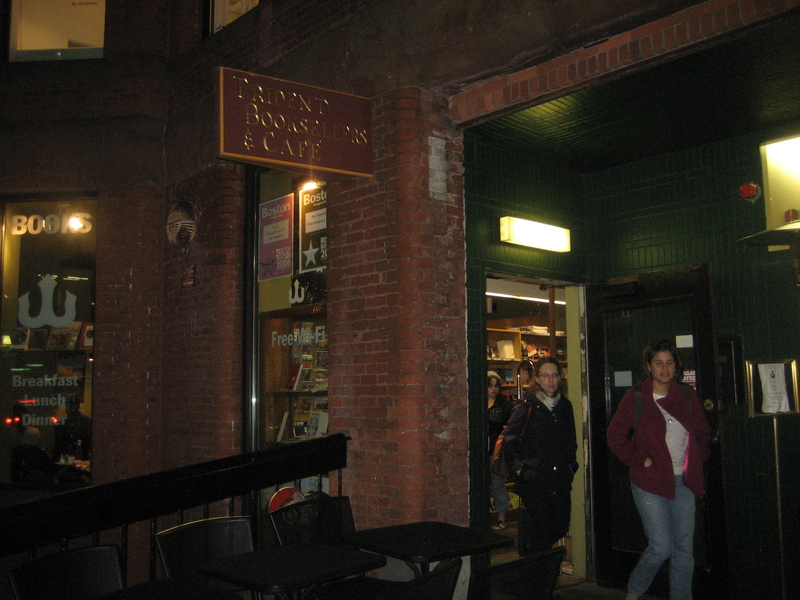 After work, I met Emily downtown at Trident Bookstore & Cafe on Newbury Street. This place is adorable! In all the years I have been in Boston, I can’t believe I have not been here. We sat in the cafe and ordered some drinks. They had a huge selection of coffee, tea, fresh-squeezed juice and smoothies, as well as a big menu. I opted for a tea tonight, since I had a fruit filled snack before getting there, but I will be back for juice and smoothies! 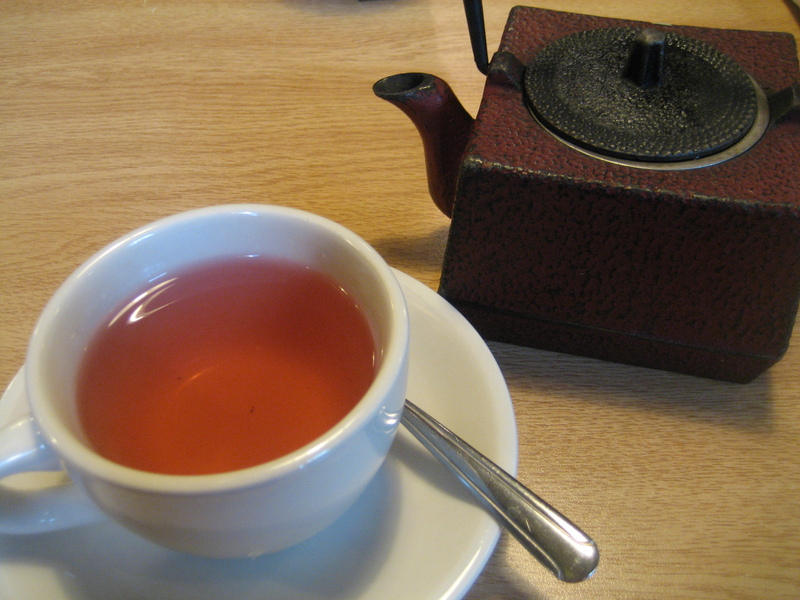 I chose the Seven Herb Tea, which was a blend of hibiscus, cloves, lavender, orange, licorice & lemon. It was delicious! The cloves made it just a tad spicy. After we chatted away for hours, we parted ways for dinner. By the time I got home, I was famished! 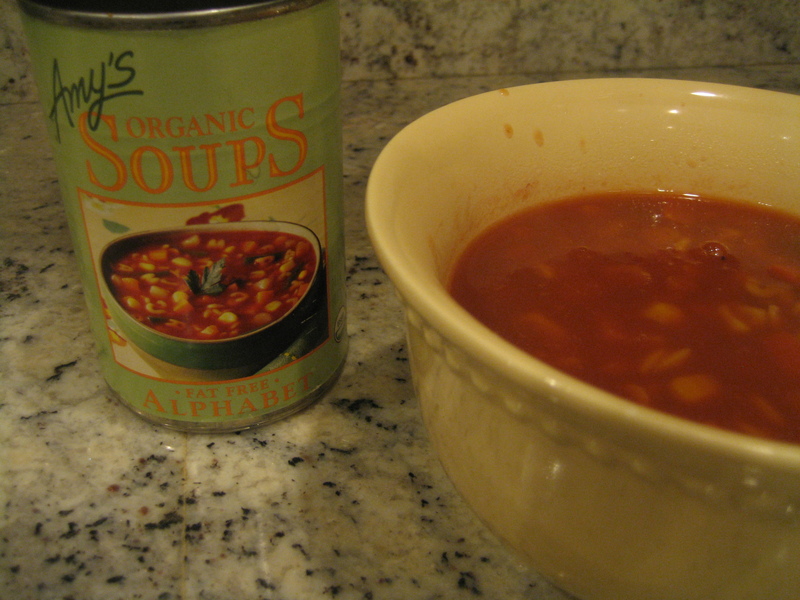 I quickly popped a Dr. Praeger’s Veggie Burger onto the grill for dinner, and a can of Amy’s Alphabet Soup in a pot on the stove. Soup & Salad Combo : Veggie burger on a whole wheat pita with lettuce, ketchup and a laughing cow wedge & Amy’s alphabet soup with kale chips (need some green!). 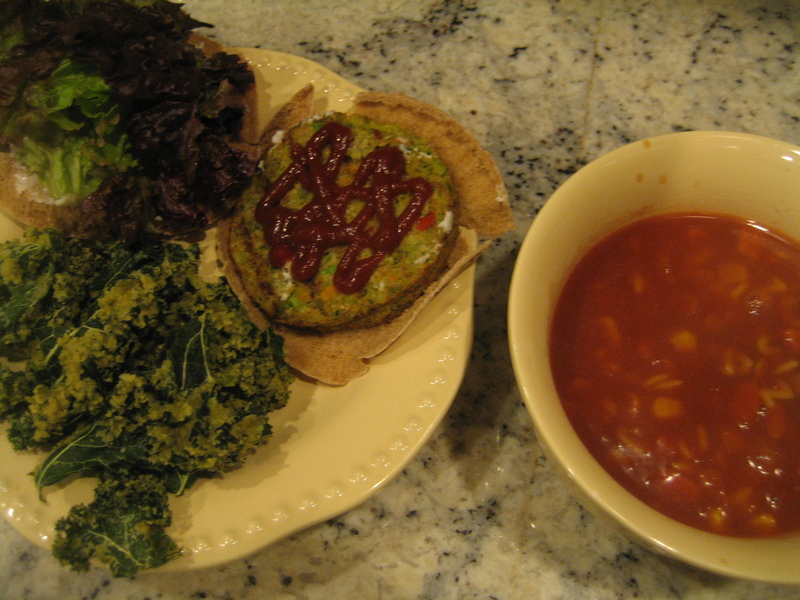 I do love these veggie burgers, and the soup was delicious. Not too salty, as many canned soups are. All in all, a perfectly nutritious, delicious and quick meal. I find that it is really important to keep a stock of some healthy lunch and dinner options in your fridge and pantry when you are trying to eat healthy. 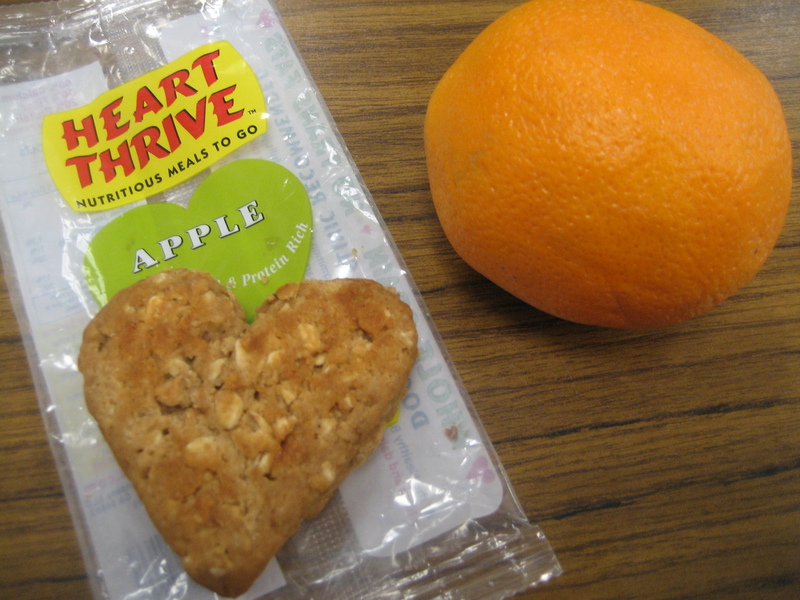 On days like today, when I get home late and am famished, I could easily reach for something unhealthy if I had it. But, for this reason, I don’t keep unhealthy options in the house. Instead of the daunting task of making a full meal, I grabbed a frozen veggie burger from the freezer, and a can of soup from the pantry. Within 5 minutes, they were both heated up and ready to eat. My lettuce was washed and ready to go, stored in a bag in the fridge (I try to prepare this every Sunday night), so it was easy to get some greens into my dinner. And, I had kale chips left over from the batch I made last week. If you take time to prepare some things over the weekend, it makes weekday dinners that much easier. What types of things do you do to make weeknight dinners quick and easy? What a cute cafe! 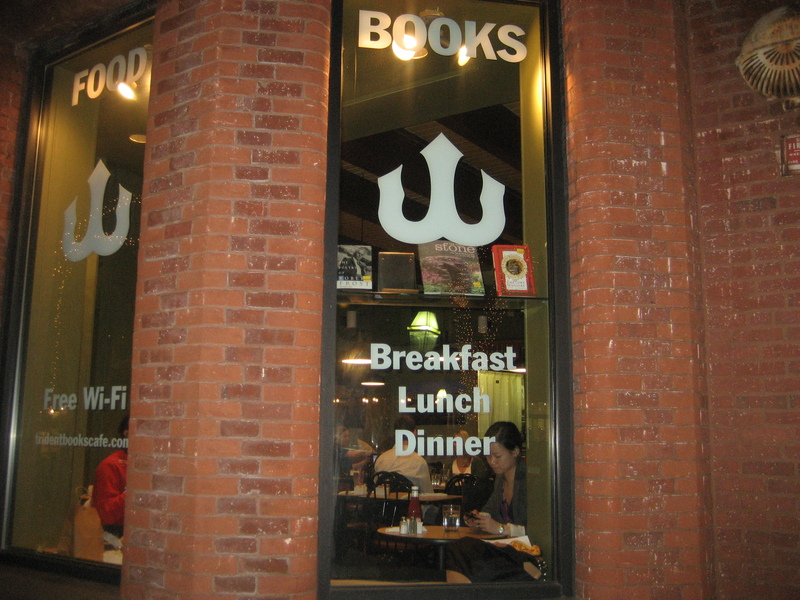 I’ve only been to Boston a couple times, but there were so many little places I wanted to try. I try to get a variety of greens, grains and protein… that TASTES good… for quick dinners. @Katie – Tasty is key!!! Otherwise, I never feel satisfied! Last nights dinner was definitely tasty :). i keep things simple with veggies, veggie burgers, frozen soup and easy one-skillet stir-frys! I have been meaning to make some homemade soup and freeze it for nights like last night! Do you have any good recipes you rely on? 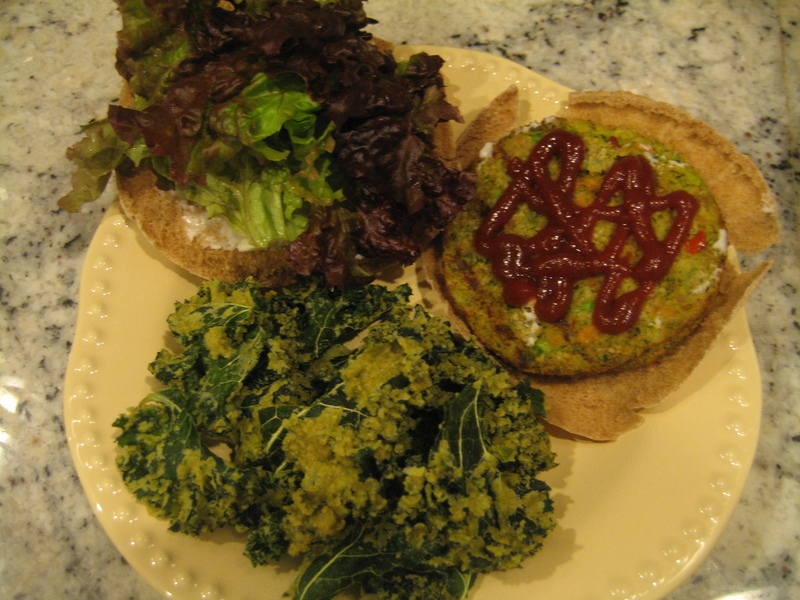 I love Dr. Praeger’s Veggie Burgers, I keep a box in our freezer for the same reason.